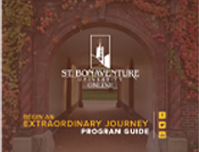 "St. Bonaventure’s MBA program is incredible. Not only is the structure of the program accommodating for the working professional, but the class sizes allow for both one-on-one interaction as well as group participation. Because of my experience at St. Bonaventure, I have a much better understanding of the ins and outs of a business, what truly makes a business successful and where I see myself in the future. SBU was the perfect fit for me. " Key Account Manager at Founders Brewing Co.